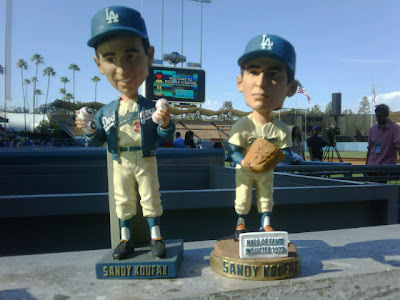 Here is an early peek at the 2013 version of Sandy Koufax's bobblehead. It will be given out at the game against the Philadelphia Phillies on Thursday, June 27th. This time they capture him mid-windup. Pic above via twitter @Dodgers. Last year there were two different Koufax versions available. See them both below. The one on the right is the more common stadium give away with an edition of 50,000, and the bobblehead on the left is the limited edition version numbered to just 1,955 copies. Today is the Old-Timers Game at Dodger Stadium. Sorry, I screwed up. I mistakenly indicated that it is tomorrow. It is in fact today. Former players from the Dodgers and Yankees will be on hand to take the field once again. The game starts at 5:30 PM, with batting practice being open to the puiblic starting at 4:30 PM. 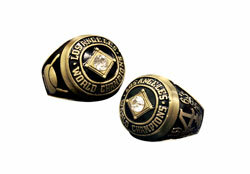 Be sure to get their early to get your replica 1963 World Series ring at the gate. 40,000 rings will be available. Below is the final roster and schedule of events. For the first time in the 2013 Amateur Draft, the Dodgers pick a high schooler. With the 124th pick in the 4th round, they choose Cody Bellinger. He is 6'4" and comes with professional Baseball bloodlines. His father is utility infielder Clay Bellinger, who played for the Yankees and Angels over a 4 year career. Furthermore, Cody was a member of a 2007 Little League World Series team from Chandler, Arizona - a team his father coached. (Cody Bellinger) also works out with the son of Dodgers scouting director Logan White in Arizona. He was at Dodger Stadium for a workout less than a week ago. 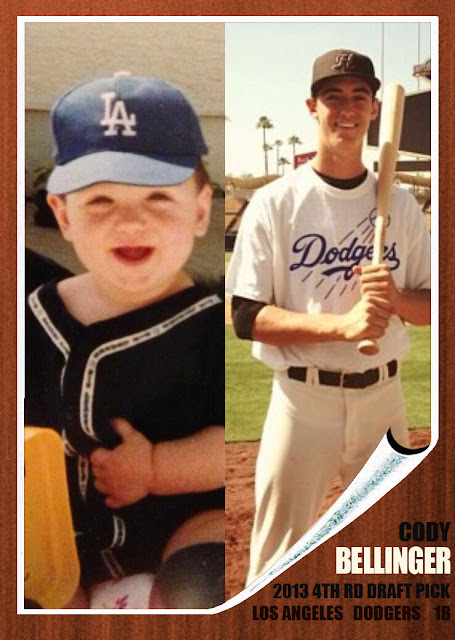 It was pretty clear he was going to be a Dodger and, indeed, the Dodgers selected the Chandler, Ariz., high school first baseman with their No. 124 overall pick Friday. Bellinger has a scholarship offer from Oregon, but it's pretty clear he's going to sign and begin his minor-league career soon. "I'm definitely ready for the next phase," Bellinger said. Based on the information above and a great pic tweeted out by his sister, I think it's fair to say that he knew beforehand what his future would be. Heck, that pic was so prescient, I had to used it along with a vintage Topps cards to make a homemade fantasy card of him. See it above. It uses a 1962 Topps design. BTW, Cody has a twitter account. Follow him here: @CodyBellinger8. I just want to thank everyone who has helped me get here! I am proud to say I am OFFICIALLY APART OF THE LOS ANGELES DODGERS ORGANIZATION!!! Austin Laymance at MLB.com provides a good rundown on Cody's background. Eric Stephen at True Blue LA also has more on Bellinger. Mark Saxon at ESPN tells us that Cody knows the Dodgers well. Here's a story from Jared Cohen at Pros2Prep.com. Check out my two previous post featuring the Dodgers first 3 draft picks here and here. BTW, This is the last post I'll do that focuses individually on each new draftee. As for the other new Dodgers selected in the first two days of the 2013 Draft, check out the handy list below. In the fifth round, Los Angeles selected their third pitcher in the draft in Palm Beach CC (FL) right-hander J.D. Underwood, the son of former Major League pitcher, Tom Underwood. The 6-foot-2, 215-pounder went 8-2 with a 1.66 ERA and 96 strikeouts in 92.1 innings this season, leading the Panthers to the Florida JUCO State Championship and earning the FCSAA Pitcher of the Year award. The Dodgers picked right-handed pitcher Jacob Rhame out of Grayson County (TX) College with their sixth-round selection after the 20-year-old went with 2-0 with a 2.16 ERA in 12 games (three starts) this season. Rhame, who is listed at 6-foot-3, 220 pounds, appeared in six games (three starts) while at the University of Oklahoma as a freshman in 2012 before transferring. In the seventh round, Los Angeles selected UC Santa Barbara shortstop Brandon Trinkwon, who batted .280 with four home runs and 37 RBI in 60 games with the Gauchos as a junior this spring. Trinkwon had a breakout season as a sophomore in 2012, batting .347 with 17 doubles, three triples, two homers and 32 RBI in 56 games and was chosen by Baseball America as a Preseason Second Team All-America and as the country’s Best Defensive Infielder heading into 2013. He batted a combined .302 during his three collegiate seasons after graduating from Beckman High School in Tustin, CA. The Dodgers selected catcher Kyle Farmer out of the University of Georgia in the eighth round. Farmer batted .290 with three homers and 44 RBI as a senior in 2013, while leading all NCAA players with 12 sacrifice flies and striking out just 12 times in 210 at-bats. Farmer ended his UGA career with the highest fielding percentage ever by Bulldogs shortstop with a .968 mark in 1,045 total chances, but will be converted to a catcher as a pro. In the ninth round, the Dodgers picked Texas Wesleyan outfielder Henry Yates. Yates, 22, played two seasons at the University of Delaware and spent his junior season at Vanguard University before transferring to Texas Wesleyan for his senior year, where he led the team with a .413 batting average and 45 RBI in 45 games. Henry’s father, David, was selected by the Phillies in the 10th round of the 1970 draft, but never reached the Majors. Los Angeles’ last selection on the second day of the 2013 First-Year Player Draft was Mansfield University (PA) right-hander Nick Keener. The 22-year-old is the son of Little League International President and Chief Executive Officer, Stephen Keener. 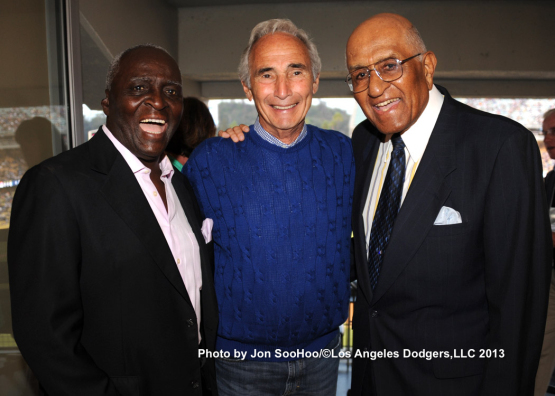 Sandy Koufax was spotted at Dodger Stadium last night with Sweet Lou Johnson and Don Newcombe. Pic via Jon SooHoo/2013 LA Dodgers 2013. See more photos from yesterday; including Schumaker getting a gatorade bath. Via Ken Gurnick at MLB.com, "First-round pick (Chris) Anderson not lacking in confidence: Hurler looking forward to going pro, sees himself in mold of Ryan Express". Asked how he would pitch Dodgers Cuban sensation Yasiel Puig, the 20-year-old right-hander from Jacksonville University didn't hesitate. "I'd attack him," said the 18th overall pick in the Draft. "That's what I do. Not to say he wouldn't get the best of me sometimes, but I'd get him, too." This is just plain awesome! Paint the Corners, better known as @EuphusBlue on twitter, created some photoshop graphics melding some vintage 1880's style Baseball cabinet photos with the wonderful mustache's of Scott Van Slyke and Peter Moylan. See the two photo's here. 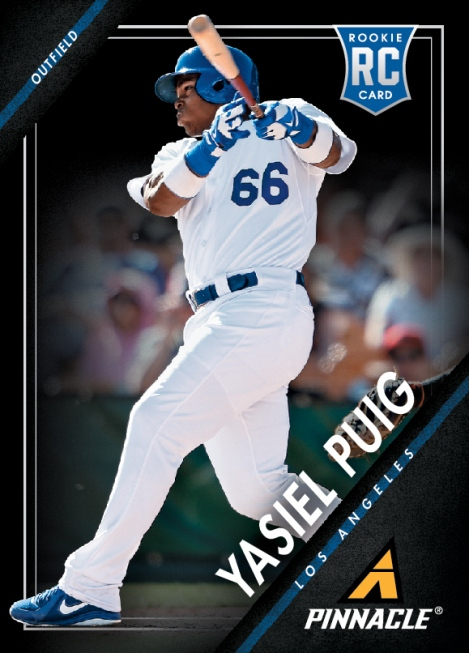 Yasiel Puig is so hot even Panini is getting in on the action. They just released a preview pic of Puig's 2013 Pinnacle Baseball card. See it below. This set will be coming out in late July. Via Monica Rodriguez at the Daily Bulletin, "Author seeks photos of local Mexican-American ballplayers". My deepest condolences to Dave Duncan and his family. His wife Jeanine recently passed away, via Derrick Goold at at St. Louis Post-Dispatch. RIP. This is just awesome. Well... having to wait 3 hours in a plane on a tarmac isn't great, but what some passengers did to pass the time is. The music starts at the 1:12 mark.